March 29, 2018, 1:30 p.m. The UK will leave the European Union on 29 March 2019. With one year to go, where does public opinion stand on Brexit? 1. Are there signs of Bregret? There are still only limited signs of Bregret , with the vast majority of Leave voters still thinking it is the right decision, and the vast majority of Remain voters still believing it was wrong decision. However, there has been a slight move away from supporting Brexit since last year – a small trend, but clear in the data. 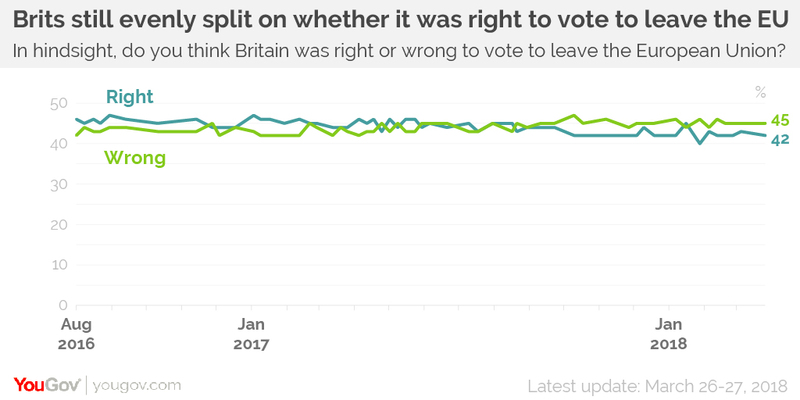 This means that our regular tracker on whether or not Brexit was the right decision is now consistently showing more people thinking that Brexit was the wrong decision. In the latest poll 45% think Britain is wrong to leave, 42% right to Leave. 2. Does Britain still want to go ahead with Brexit? While slightly more people now think Brexit was the wrong decision that’s not the same as people thinking it should be stopped. 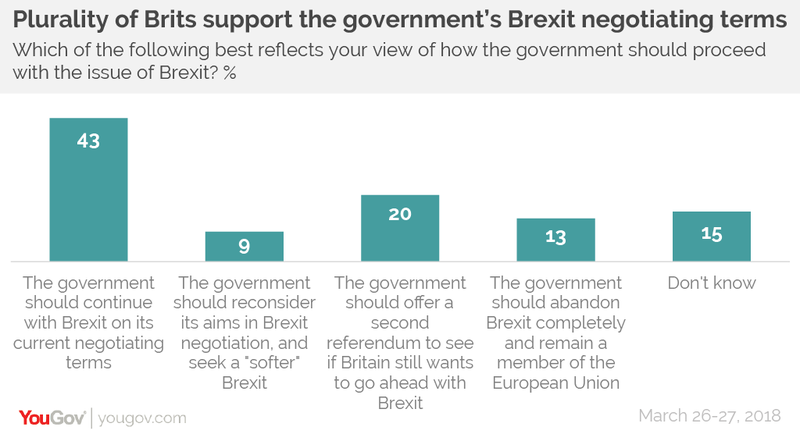 When asked what the government should do next, a majority of people still think they should continue with Brexit in some form. Over four in ten (43%) think they should continue on their current terms, 9% think they should proceed with a “softer” Brexit instead, 20% would like a fresh referendum and 13% would like the government to just stop Brexit completely. The reason for the contrast between the proportion of people thinking Brexit was the right choice and the higher number who think it should go ahead is that a minority of Remain voters (30% in our latest poll) nevertheless think that the government should go ahead with Brexit. This is presumably because they think the government has a duty to implement the referendum result. 3. 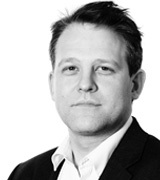 Are we pessimistic or optimistic about Brexit? On most measures more people think Brexit will have a negative on Britain than think it will have a positive impact. Four in ten (42%) believe it will make the economy worse, while only 24% reckon it will make it better; 38% think the UK will have less influence, and only 17% believe it will have more; 37% reckon it will be bad for jobs, but only 23% think it will be good for jobs; 31% believe it will be bad for the NHS, against 25% that reckon it will be good for the health service. However, it’s worth noting that this isn’t a new development and isn’t a sign of people turning against Brexit. In terms of the economy, jobs, and British influence these results are very similar to people’s opinions just before the referendum. Britain voted for Brexit despite more people thinking it would have a negative impact on the economy and jobs. This is because while Remain voters overwhelming expect the impact of Brexit to be negative, Leave voters tend to be split between expecting a positive impact and little economic impact either way. The only one of these trackers that has changed substantially since the referendum is the NHS. Back in June 2016 people thought Brexit would be good for the NHS but now the balance of opinion is that it will be negative. 4. Are people just bored with Brexit? One possible explanation for why views on Brexit have barely changed is that the public have switched off from the issue and are not following the ins-and-outs of the negotiations. Our research seems to bear this out. Only 10% of people say they are following news reports about Brexit “very closely” (a further 37% say they are following things “fairly closely”). 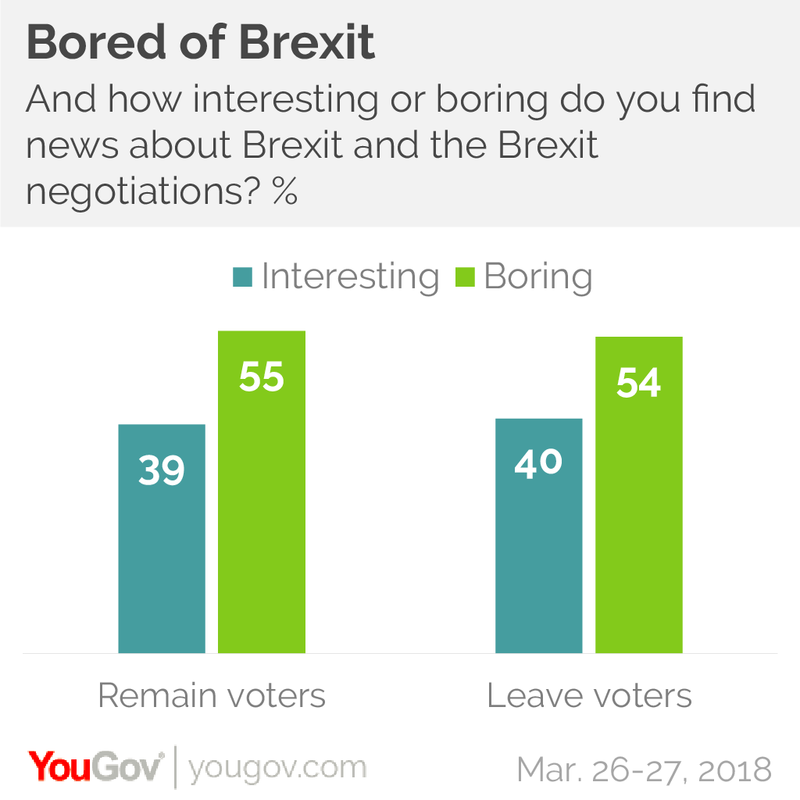 A majority of both Leavers and Remainers say they find news about Brexit boring. 5. Who is winning in the negotiations? A majority of the public (56%) think the government is doing a bad job at negotiating Brexit, with only 28% believing it is doing well. Almost half (49%) of people think that the European Union has had the upper hand so far, and that Britain has generally accepted the EU’s demands – just 3% say that the European Union has generally accepted Britain’s demands. A quarter (26%) think there has been give and take on both sides. Despite the government being widely seen as doing badly in the negotiations, the Conservatives are still seen as being more likely to do a better job than Labour. A third (34%) of people trust Theresa May more to negotiate Brexit, 14% prefer Jeremy Corbyn. Overall, Labour appears to be struggling to win public support on Brexit. Only 16% of people think that the party’s position on the issue is clear, and only 17% say they support the position Jeremy Corbyn has taken over Brexit. For the Conservatives the position is better, but even so only a minority think their policy on Brexit is clear (30%) and support May’s approach (36%). The two-year transition period after Britain leaves the EU is less controversial than might be expected. Half (50%) think it’s a good idea, while approaching a quarter (23%) do not – this is mostly because Remain voters are very much in favour of a transition while Leave voters are split. If there is to be a transition period, then 30% would prefer a one year transition, 49% prefer a transition of two years or more, and 21% don’t know. Different polling questions by different companies have found varying levels of support for a second referendum. Our latest poll finds 36% of the public think that once terms are agreed there should be a referendum on whether or not to accept them, while 42% of people think there should not. 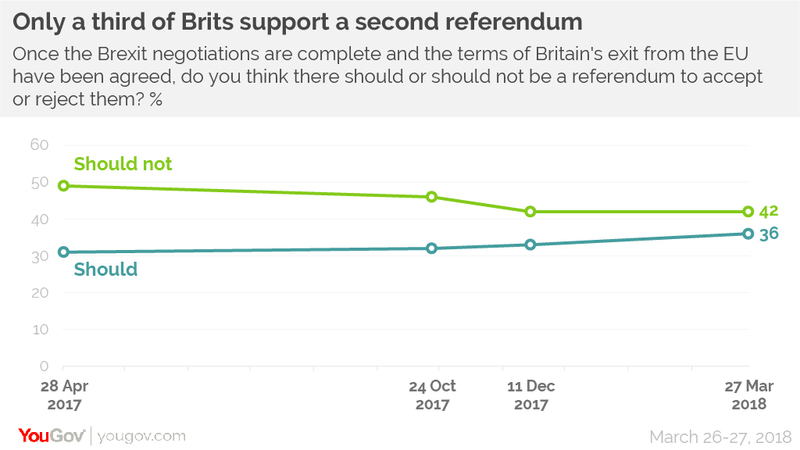 However, support for a second referendum has been gradually ticking upwards. When we originally asked this question back in April 2017, 31% supported a second referendum and 49% were opposed. 9. Would it be acceptable for MPs to block the deal? Whether or not there is another referendum, the government has already promised a vote in the House of Commons on whether or not the deal should be accepted. 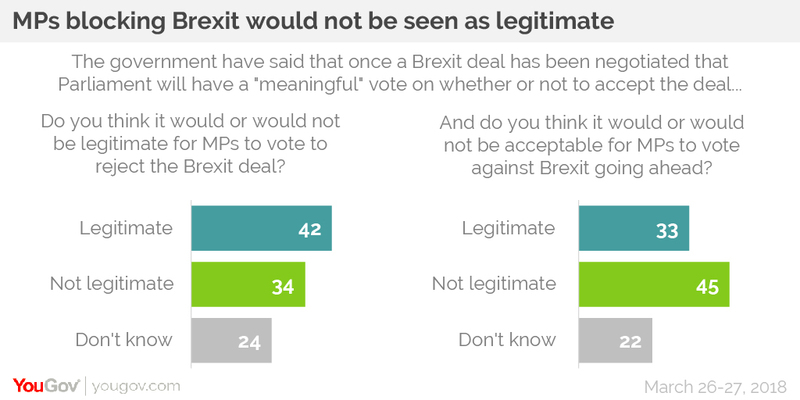 Four in ten (42%) think it would be legitimate for MPs to reject the deal while a third (34%) do not (24% don’t know). However, that’s not the same as MPs voting to stop Brexit going ahead at all. The proportion of people who think this would be legitimate (33%) is outweighed by those who think it would be illegitimate (45%). A fifth (22%) don’t know. As one might expect, these questions divide sharply down partisan lines, with a majority of Remainers thinking it would be fine for MPs to block Brexit, while very few Leave voters believing the same. The last week’s news headlines have been dominated about allegations that Vote Leave broke campaign spending rules during the referendum. But has this cut through to the public? Looking at the data we can see the familiar pattern of people viewing the news through a partisan filter. 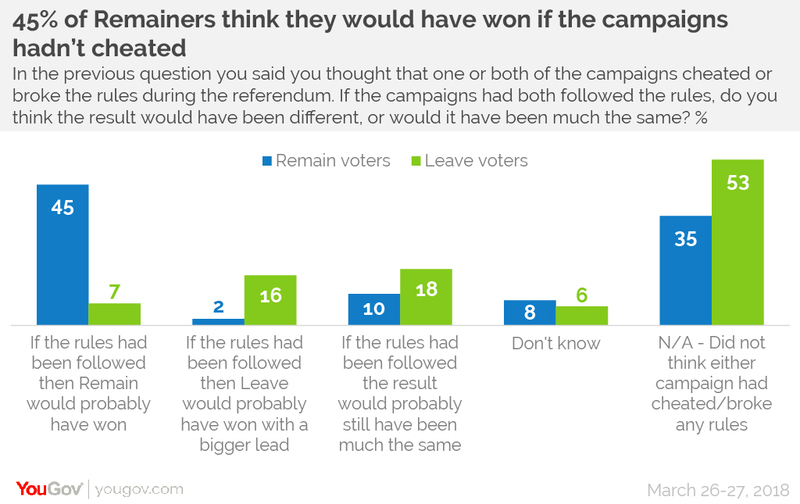 A majority of those who voted Remain think that Leave cheated (though a substantial minority think that the Remain campaign cheated too), and 45% of Remainers think that if the referendum campaigns had followed the rules then Remain would have ended up winning. However, the allegations carry little weight with Leave voters. 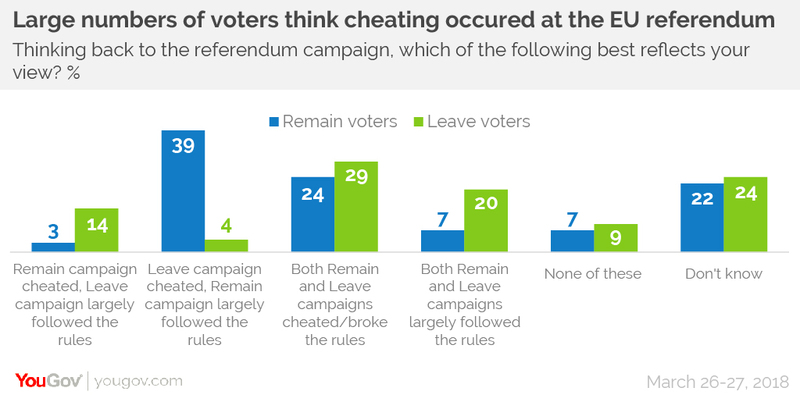 Only 4% of those who voted to get out of the European Union think that the Leave campaign alone broke the rules, while 14% think that only Remain cheated, and 29% think that both sides cheated. 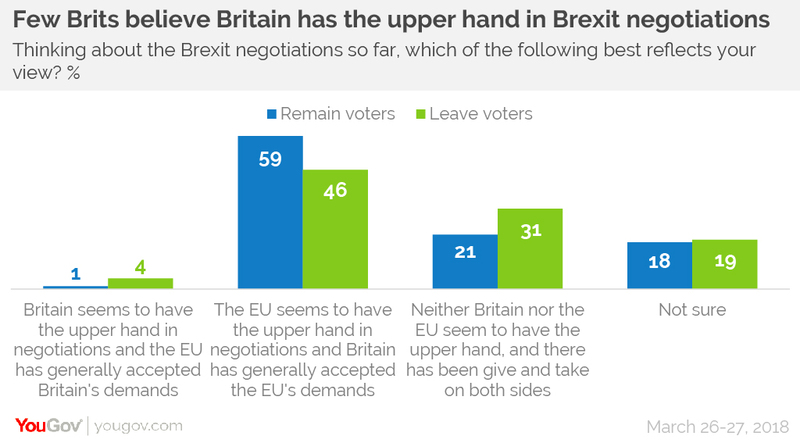 As with so much of the Brexit discussion since 2016, Britain remains sharply divided between Remainers and Leavers.